Many people suffer the effects of thyroid disease which include hypothyroidism, hyperthyroidism, Grave’s disease, Hashimoto’s thyroiditis (autoimmune thyroiditis), generalized thyroid inflammation and thyroid cancer. Unrelated human subjects share 99.9% of their genome. It has been estimated that 90% of the remaining variation is accounted for by approximately 10 million common single nucleotide polymorphisms (SNPs), single base changes spread throughout the genome. These are very useful in studying gene-phenotype associations as they occur commonly in the general population, and may either cause changes in gene function themselves, or more frequently are markers of nearby elements that do. Genetics play a prominent role in both determination of thyroid instability and increased disease risk. Heritability studies have suggested that up to 67% of circulating thyroid hormone and TSH concentrations are genetically determined, suggesting a genetic basis for narrow intra-individual variation in levels, perhaps a genetic ‘set point’. Thyroid hormones play an essential role in normal human physiology with effects on almost all tissues to influence growth and development, maintain normal cognition, cardiovascular function, bone health, metabolism and energy balance. With increasing research in genetic implications we understand the important influence that genetics play in normal and abnormal thyroid function. There is also strong connection in utilization and conversion of thyroid hormones in thyroid instability and there are certain genes that are involved in this conversion, for example, DIO1, DIO2, DIO3 are all involved. Some genes known to influence thyroid function, including iodothyronine deiodinase 2 and the TSH receptor, have been shown to influence a wide range of clinical and developmental phenotypes from bone health to neurological development and longevity; such observations will help us understand the complex action of thyroid hormones on individual tissues. Autoimmune thyroid disease commonly runs in families, and the search for genes that increase susceptibility has identified several good candidates, particularly those involved in immune regulation and thyroid function. However, these genes alone account for only a small percentage of the current prevalence of these disorders. Although the advancement of genetic technology has led to many significant findings in the last two decades, it is clear that we are only just beginning to understand the role of genetics in thyroid function and disease. There are many genes / variants that are integrally involved in thyroid function and regulation and key genes listed below are associated with thyroid functional changes. Neck pain:In many cases, neck pain starts in the front. In some cases the neck pain may extend all the way to the ears. Voice changes:Experiencing hoarseness or other voice changes that do not go away could be a sign of thyroid cancer. Breathing problems:Sometimes thyroid cancer patients say it feels like they are breathing through a straw. This breathing difficulty is often a symptom of the disease. Coughing:A cough that continues and is not related to a cold. Trouble swallowing:A growth or nodule on the thyroid gland may interfere with swallowing. 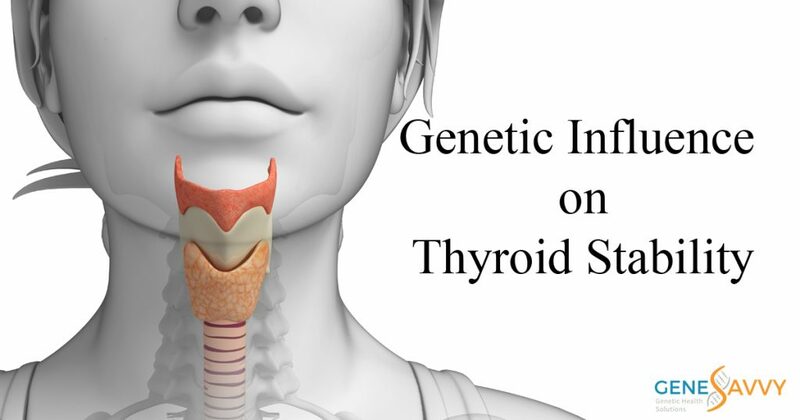 The ThyroidStabilityGS genetic panel curates gene relationships for hypothyroidism, hyperthyroidism, thyroid inflammation, Hashimoto’s thyroiditis, autoimmune thyroiditis and thyroid cancer risk for a more focused diagnosis and targeted treatable action plan.